The Ocean County Soil Conservation District offers a variety of educational programs, workshops and events for community members, as well as students, educators and professionals throughout Ocean County. Click-on any topic below to learn more about it! Or, contact Becky Laboy, Education Outreach Specialist, 609-971-7002 ext. 114, education@soildistrict.org. 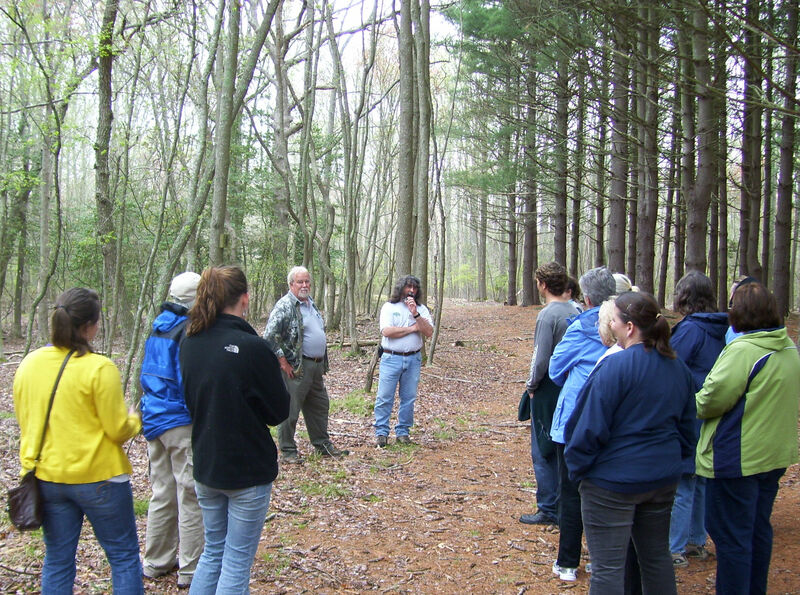 The Ocean County Soil Conservation District offers a wide variety of educational programs and workshops to educate the community about the importance of soil health, to build strong connections to our native landscapes, and to inspire stewardship of our watershed. Learn more about the many educational opportunities in Ocean County provided by the Ocean County Soil Conservation District. 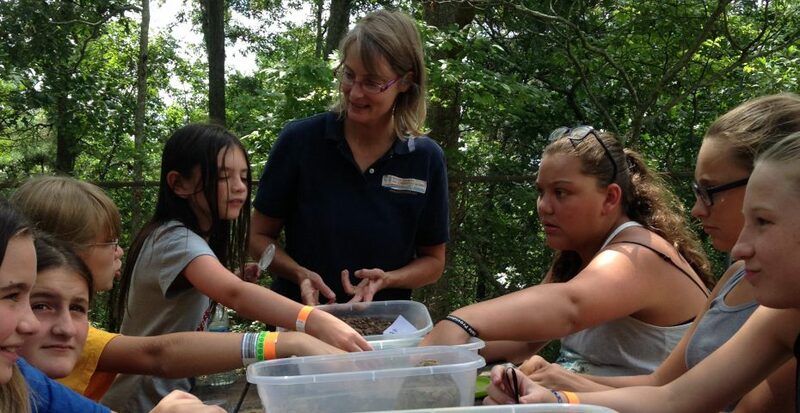 Programs are available to community members, scouts, teachers, students, garden clubs, environmental committees, non-profit organizations, and groups interested in learning about healthy soil, native plants, and how to support wildlife. Join us at one of our outreach programs, or book a free program that supports your group’s interests. The Jersey-Friendly Yards website was created by Barnegat Bay Partnership in 2015, and piloted by Ocean County Soil Conservation District. The user-friendly tools and resources offered on the website support gardeners in the planning, design and creation of their own “Jersey-Friendly” yard, garden or landscape. Over the past 5 years, OCSCD has created 22 Jersey-Friendly gardens throughout the Barnegat Bay watershed. Our Jersey-Friendly garden located at the OceanFirst Bank Branch on Hooper Ave in Toms River was awarded the “2018 Garden of Distiction”, by the prestigious Pennsylvania Horticulture Society. Visit one of our Jersey-Friendly demonstration gardens in Ocean County or create your own. Link to the Jersey-Friendly Yards website to learn how to create a beautiful landscape that doesn’t harm the environment and supports wildlife! The New Jersey Conservation Poster Contest is an annual contest sponsored by the NJ Department of Agriculture, the NJ Association of Conservation Districts and the Ocean County Soil Conservation District, which aims to promote a better understanding of the connection between natural resources and humans, in a fun and creative way that engages students throughout the county, state and nation. The Ocean County contest is open to students in grades 2-12. Cash prizes are awarded! Find out how you can participate in this exciting contest. Ocean County Soil Conservation District, in partnership with the New Jersey Division of Fish & Wildlife and Trout Unlimited, provide a unique learning experience for students through the Trout in the Classroom program. Students raise trout from fry in their classroom then release the fish into a healthy New Jersey stream in the spring. Learn more about this exciting program! The Ocean County Soil Conservation District is an active leader in the community. The District exhibits at local festivals and events, and disseminates complimentary literature and information to residents looking to build healthier home landscapes, gardens and community ecosystems. Look for the OCSCD table at your next community event or festival! Each year, the Ocean County Soil Conservation teams up with the Lighthouse Center for Natural Resource Education to host the Barnegat Bay Environmental Educators Roundtable. This event is designed for educators throughout the watershed to come and participate in various workshops, enhance their knowledge and gain valuable resources that support environmental topics in the classroom. This event has become extremely popular since its inception in 1997, and helps promote environmental stewardship values in educators and the students they teach each year. The Ocean County Soil Conservation District is a proud sponsor of the New Jersey State Envirothon. This annual competition culminates in one intense day where high school students test their knowledge of environmental topics through hands-on and interactive problem solving at five different stations. Winning teams move on to represent New Jersey in the North American Envirothon competition which is the largest high school environmental education competition in North America. The Ocean County Soil Conservation District partners with many other organizations throughout the county and watershed to create a healthier community. Learn more about the many projects implemented by the District. The Soil Health Improvement Project consists of 5 native plant demonstration gardens, hosted by Jakes Branch County Park, that offer homeowners an opportunity to see and learn about the many native plants available for sunny, shady, dry and wet landscapes in Ocean County. Learn more about this project and start creating your own native plant garden or landscape in your yard! The Soil District, along with various partners, has successfully designed, planted, and implemented over twenty-five different Outdoor Classrooms at schools throughout the Barnegat Bay Watershed. These rain gardens give students and teachers the opportunity to have a change from the norm and get outside to learn about the environment in hands-on, exciting new ways. The Ocean County Soil Conservation District has made available numerous resources to help you learn more about healthy soil, native plants, pollinators and more, and to connect with other like-minded groups within the community. This comprehensive booklet was created by the Ocean County Soil Conservation District as a one-stop guide for all educational resources related to the Barnegat Bay watershed. 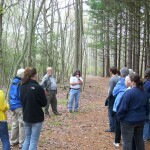 What began as a simple directory has grown into a compendium of resources and organizations offering numerous programs, publications, field trips, and watershed information that educators can incorporate into their lessons and activities. In 2012 the Ocean County Soil Conservation District partnered with the New Jersey Association of Conservation Districts and the Barnegat Bay Partnership to organize the Soil Health Conference: “Sustainable Opportunities through Soil” hosted at Ocean County College in Toms River, NJ. The main goals of this conference were to raise awareness of the importance of healthy soil in infrastructure as well as ignite conversation between a wide variety of professionals, ranging from lawn care specialists, to professors, to life-long soil scientists. The conference was an enormous success. 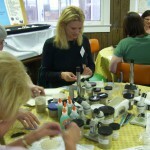 Please find more information about the 2012 Soil Health Conference here.